If you have multiple devices running iOS 8 and using the same Apple ID, you’ve probably noticed that an incoming phone call rings on every one of the devices at the same time. In other words, an inbound phone call will ring not only your iPhone, but also any other iPad, iOS device, or Mac too if it’s running OS X Yosemite. While this feature can be convenient and make it much less likely that you’ll ever miss a phone call, it can also be a nuisance if you have a desk full of hardware that is all buzzing simultaneously. This puts an end to the multiple device ringing feature. It’s worth mentioning that if you turn this feature off you can’t make phone calls from your Mac or other iOS device by way of your iPhone cellular connection. Despite being in the FaceTime settings, it has no effect on standard FaceTime audio calls made from a Mac or FaceTime VOIP from iOS, and FaceTime video chat still works as usual too. 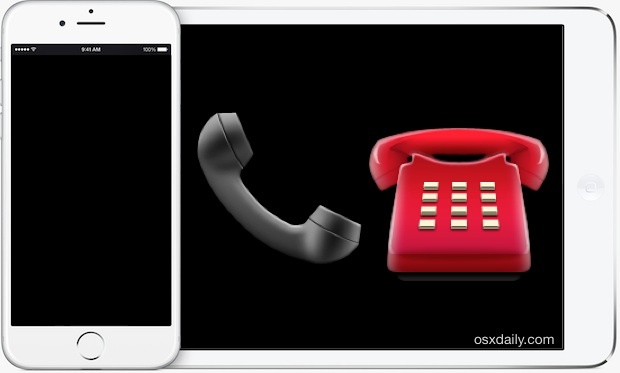 Separately, you can choose to disable the iPhone calling feature on the Mac as well. I don’t see this option; only an option to turn on or off. 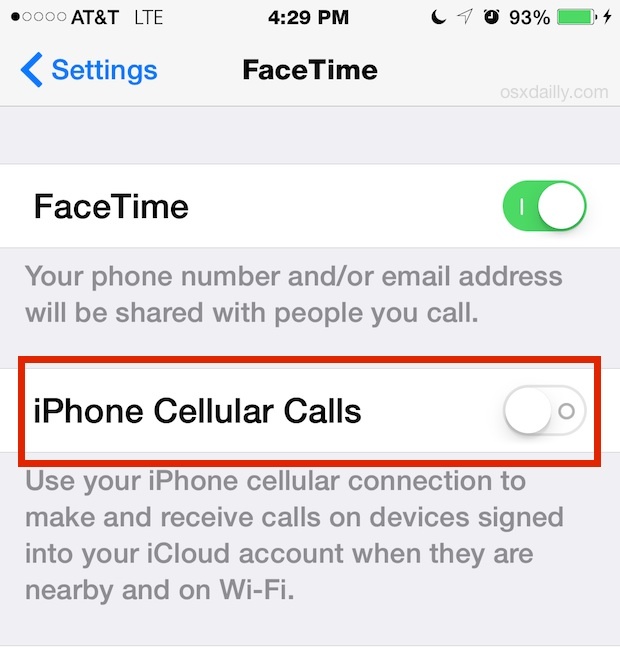 If it’s not on your iPhone, go to FaceTime settings on your iPad, activate FaceTime and then you get the option on the iPad to deselect calls made to your iPhone. Thanks, this was driving me crazy. My wife would get a call and my phone would ring (Using the same Apple ID). Look into setting up seperate Apple IDs and start using family sharing feature in iOS8. Thanks so much for this tip. I was wondering why my iPad was reacting whenever my iPhone rang. Problem solved! nice tip, thanks for sharing! This is timely! I just upgraded to a 5S from a 4S. I had already removed the SIM card, turned off cellular and WiFi on the 4S but despite that both phones rang when I got a call. It seemed impossible, so now I know why it happened. Thanks! Who thought this was a good “feature”? First it was just iMessage that broadcasts the txt messages meant for just me but went to the kids too. Now phone calls that get broadcast to the kids iPads!! This is nuts as my kids do not need their own apple IDs for any reason. I totally agree, and advising the end-user to get a separate Apple ID for each person in the family is the wrong answer for most of us! But who really needs icloud? The only people who need iCloud are people who have data that they don’t want to loose. People who want to loose data don’t need iCloud. I want to keep this feature turned on, so I can use the MacBook/iPad to answer when convenient, but mute the call as it is coming in on my computer. It’s just plain intrusive for the call to be ringing so loudly from all devices. If anyone knows the trick for this, please let me know. I’ve turned it off on my iPhone, and I turned it off on my Mac, and I restarted everything… and still all get the call at the same time!!! Annoying function!!! I understand some people might think this is convenient, but that’s an option, not a default!!! Even though I have switched off the function on all my devices I am still getting facetime calls across all my devices. IT’s really annoying and separate ID’s is not a viable option for me. Is there anything else that can be done to stop this? Thanks a lot for the tip! I also was quite annoyed by this “feature”. I think the main problem here is that iPads can be “shared” devices within a family (ours is lying around in the living room and whoever wants to use it can use it) and phones are usually “private”. This issue is not addressed at all by Apple! On the Mac we have different users with different Apple IDs but on the iPad this is not possible! My wife’s iPhone ring tones were sounding over our Sonos system. Very annoying. Thank you for providing a solution. Not sure why yo can’t lower the volume or switch the ringing off completely; since you’re supposed to be in the same room or area anyway, you’ll hear your phone ringing and can therefore choose which device you want to use for answering a call; or, you will just see it on your screen when your ipad/mac is closer… Also, would be nice to be able to test the ringtone on the non-phone device too…. It’s worth noting that this WILL NOT stop this from happening with FaceTime Audio/Video calls; ALL devices using the same Apple ID and either on WiFi or cellular will receive those incoming calls. The only way you’re going to stop that is by using separate IDs on each person’s device, or by turning FaceTime off altogether on those devices. Setting up new accounts to fix a hardware issue seems a bit like avoiding the obvious solution by putting the ‘burden’ on the user, don’t you think? Once again, all devices need to be in the same room/area anyway so which would you prefer; seperate accounts for your iMac, MacBook, iPad and iPhone each or a smart, Apple-worthy-solution? I was told that separate I cloud accounts for each device/ family member is the only solution. However If I do this I won’t see pictures of my kids that get shared on iPhoto stream my wife takes while I’m at work. I know everyone’s situation & needs are different but you would think that apple has these issues fixed. Since Steve Job’s passing I’ve noticed a gradual decline. They’re coming out with new features like calls on other devices but it’s causing more inconvenience. Please, can somebody help me solve the horrible echo on my iPhone 6? It seems to happen on incoming calls; I hear my own voice, a little out of sych, and it’s so hard to talk over it!! It’s a pain in the buttons to have a different Apple iD for all of my devices. To have all of my devices ringing on a phone call should be by default set to off not on. I am betting that 90 plus percent of the users would vote to removed this feature. Having to set FaceTime off on all of my devices is ok, who needs it, but they all still ring when I have them on wifi. The only thing I want to share between my devices is my iTunes library and the ability to track my phone if it gets lost or stolen. Can I share my iTunes library among my devices with different Apple IDs? What a bunch of noobs. Bother to create and to use different Apple IDs for different persons. Apple ID is not just a login to make an Apple device to work. It’s a feature to get your multiple devices to work seamlessly. Thanks for your kind input. By assigning different email addresses on each device to FaceTime and iMessage you can have the benefit of using same Apple ID, but have each device only receive intended FaceTime calls and iMessages. In FaceTime settings, under the section entitled “You can be reached by FaceTime at” select “Add Another Email…” and enter the unique email of the user on that device. Then uncheck any other email addresses not applicable to that device. The same can be done for iMessage. My kids use my old iPhones and use my Apple ID, I have assigned unique email addresses to each so that we can all place and receive our own FaceTime calls, including calling each other. I turned this feature off, and it’s still happening!! Help!! For me too, despite disabling this feature i still get my iPad ringing when it’s locked! When my iPad is just on everything is fine. Very generous of you to describe the decline as gradual because I’d say, when Steve Jobs died, he took iPhones with him. I have 2 iPhones, each with a different number and different carriers but all of my devices ring when someone calls or texts, including my iPad, and the iPad is only wifi. I just want each phone to ring respectively. If you called one iphone then I only want that iPhone to ring. If you sent a text to my other iPhone then I only want to view it on that iPhone respectively. Why is it more difficult to disable this “feature” than it is to configure the phone to function normally?? Why do I have to tinker with settings for my phone to work as it should anyway? Lastly, how did this issue get overlooked rather than being obvious??? Can someone please explain how to set each phone to work normally even to ûnnmto have all the bells & whistles active simultaneously shut off this “feature” before I lose my mind????? Thank you! It has been so disruptive to have my computer ring lately. So can anyone confirm when do calls show on your iPad? Is it only when your iPhone and iPad use the same Apple ID and are on the same wifi network? Reason I ask is I’ve lost my phone and just before its battery died my husband phoned it. The call came through on my iPad and I thought I heard something vibrate (do iPads vibrate or could it have been my phone?) then the battery died. I’ve read in some places that they must be on the same wifi network for calls to come through is this true or do they both just need wifi? If you want you can disable only the devices you don’t want to receive calls but still keep multiple devices to receive calls from. Allow Calls ON will show all the devices that have the same Apple ID. This is the answer right here. Works perfectly! Thanks for the valuable tip. Is this feature charged by the mobile operator/roaming or only an nternet connection? This works great for stopping calls to multiple devices, you must follow the instructions if you don’t want your other hardware ringing when iPhone gets a call. This is the only solution to stop that, if you don’t follow the instructions as described you will have your experience where it doesn’t work, so do it again and read the instructions in the tutorial. I use this every time I get a new iPhone or Mac, I don’t want the new ones ringing, only my original one. Is anyone else having a problem with multiple iPhones ringing when one is called since the IOS 10 update? I’ve found the solution and it’s rather simple! I tried all the solutions online ( turning off hand off, ensuring calls on other devices were off and having a different ID for the iMessage and FaceTime on each device) but it still allowed the kids / husbands phone to ring / get missed calls if my phone was called. If you have all the family’s devices on 1 Apple ID and you are also using that Apple ID for FaceTime and iMessage on one of the devices then create a new Apple ID for that one device just for FaceTime and iMessage. This breaks the link and the other phones stop ringing. Hope this helps someone because it’s been driving me mad since the update. « Retina Display iMac Expected to Launch This Fall?